One of the most common reasons that people commit to going to an Omaha gym is because they want a flat and toned stomach. If great abs are one of your top goals, Omaha Barbell can help. 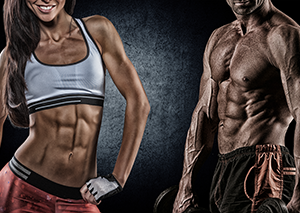 Although there are countless products advertised on television that claim to be the secret to amazing abs, you don’t need to spend your hard-earned money on any of those gimmicks. It’s hard to make time for a workout every single day. Because things come up and life gets in the way, we always tell people to aim for 3-4 workouts a week instead of feeling pressured to make it happen every day. One reason for this advice is daily training simply isn’t necessary to get great results. This is an especially important point to keep in mind about abs. Although paid ab products have conditioned people to think they should hit abs every day, doing a solid ab workout 1-2 times per week is enough for consistent progress. While ab exercises are definitely important, your caloric intake plays just as big of a role in getting the abs you desire. If you’re working out hard but then eating more calories than your body needs, you’re not going to get great abs. In order to get the abs you want, you need to find an approach to eating that enables you to keep your calories in check. And when you hit a gym in Omaha, you’ll want to include some cardio as well. This will help you get your body fat to the point where your abs are visible. If you stick to consistently doing ab exercises at an Omaha gym, keep your caloric intake under control and maintain a cardio routine, you will get well-defined abs. The one thing to keep in mind is they may not look exactly like people you’ve seen online. The reason is genetics play a role in whether someone has a 4, 6 or 8 pack. Since there are a lot of ab variations, all you need to focus on is getting the definition that will make you feel great. Our Omaha gym offers a great environment for working out. While the atmosphere is very positive and supportive, you’ll also have the space you need to focus on getting a great workout. And if you have any questions about our very reasonable rates or anything else related to our gym, you can always speak with a member of the Omaha Barbell team by calling (402) 594-4485.